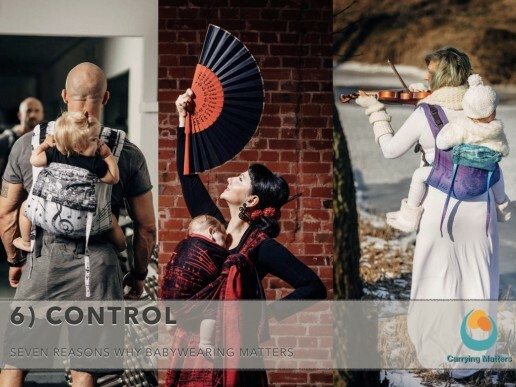 "Seven Reasons Why Babywearing Matters"
A talk given in Poland in 2018. Carrying children matters; it makes a difference to their futures, their parents and the society they grow up into. The opportunity to use a safe and comfortable carrier to keep a child close can change a family's long term outcomes. 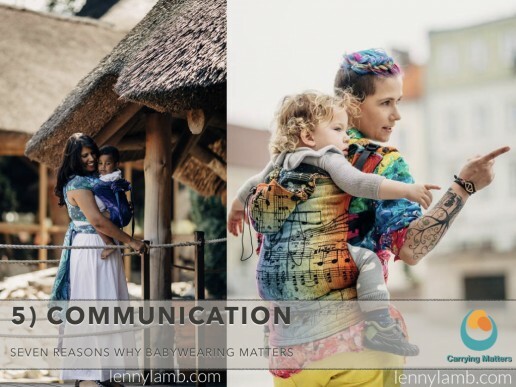 Here are seven simple reasons why babywearing matters. Human beings thrive on love. Food, drink and shelter alone are not enough for good health and wellbeing. Love and connection at the start of a child’s life are essential for healthy growth; a child’s long term outcomes depend on the start they get in life. The “4th Trimester” period is the first few months of life outside the womb. In these early months, vulnerable babies long to be close to their caregivers, and express their feelings with their bodies and their voices. Birth is a huge event for babies; it is often prolonged and may be traumatic. Life on the outside comes as a shock; it is cold, bright, noisy (or very quiet). There is a distressing sense of space and a lack of soft boundary. A baby will never have experienced the feeling of fingers holding them tightly, or large movements through space. They’ll never have been hungry or thirsty before, they’ve never felt stomach discomfort or experienced the frustrations of needing to get food before. Often tiny babies will only calm and settle when held in loving arms, especially skin to skin, rocked and murmured to, as this reminiscent of life in the womb. Their sense of smell and touch are among the most well developed at birth. As babies are held, stroked and kept close, this soft touch stimulates the release of oxytocin in the brain, the hormone of love and connection. Oxytocin is vital for the building of connections; secure attachment relationships are essential to building a child’s sense of self worth and self confidence. Holding and carrying children does not spoil them; it helps to build them up; the investment in children’s internal sense of security and belonging that leads to long-term health and wellbeing is worth it many times over. The first three years are key for optimum brain growth, with millions of brain synapses being created. A brain that grows up in a nurturing and loving environment is wired very differently from one that is exposed to chronic stress. These early years may feel endless to a tired parent. However, in the context of a long life of 70-80 years it is actually very small. Parenting is worth doing well. Parents need to connect to their babies too – it is a two-way relationship. It can take time; the common idea of the immediate sunburst of the greatest love of all isn’t the experience of many any more. Pregnancy, labour and birth are often exhausting and difficult and many of the natural hormonal cascades of bonding are interrupted. The tiredness and loneliness of new parenthood can be very demoralising and depressing. Good breastfeeding support can be hard to access. This is where babywearing can help parents so much, especially in the postnatal period; the soft touch of a baby stimulates oxytocin release in adults. As this hormone builds, connection develops and a bond will form. A parent will begin to feel the joy and reward of interacting and engaging with their baby. This sense that “it is worth it”, an enjoyment of their baby and a growing sense of love is what keeps parents going during the tougher times. Holding and carrying babies is essential for families to thrive and enjoy being together. A good sling will facilitate this, especially in a world where parents are told to “put that baby down” and “get back to normal”. Babywearing is not a new idea, even though many people say “they didn’t have those things in my day” and describe it as a “modern fad.” There are cave paintings suggesting that children were carried on the back during hunts and foraging. There is plenty of ancient art showing that human beings around the world have found tools to carry their babies to keep them safe and with their families as they move around. One anthropologist (Timothy Taylor) believes that being able to migrate long distances with children held in carriers was key to the human race being able to spread around the globe and become as successful as it is. Being able to keep a baby where it belongs (close to you!) while you have your hands free makes life work better wherever you are. This may be in the rice fields, in the jungle, or climbing high mountains with the goats. It is a common solution to an age-old problem of “How do I keep my baby with me as I work?” all around the world, using furs, reeds, woven grasses and cloths. Keeping our babies close is especially important in modern times. Life in our society is busy and frenetic, with many demands on our time and high expectations from our peers to “get back to normal”. There are many incorrect fears that we are spoiling our babies by holding them; far from it! A baby in a sling gives a parent their hands back to be able to look after themselves, do the daily chores, get around more easily, answer the phone, care for older children, get to check ups, fill out forms, do the shopping. 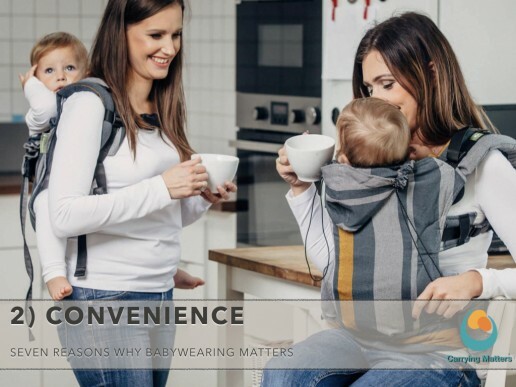 Time with our babies is precious and fleeting; being able to take them with us in a sling allows us to meet their needs for connection while we can be hands-free. Babies who are carried tend to cry less; the small but often-quoted Hunziker and Barr study suggests it may be as much as 43% less than their non-carried counterparts. Babywearing parents have all experienced this for themselves! This will be in part due to the calming effect of soft touch and cuddles on babies; the oxytocin hormone reduces stress and increases feelings of wellbeing. The soft touch also activates slow nerve fibres in the skin that affects and reduces the stress response; chronic, unmitigated stress is harmful to the growing brain. Many of us will have experienced how the feel of woven fabric being drawn gently across a baby’s back as they are brought close seems to have a very soothing effect; the massage and familiar movements calm them down, and often they are asleep before the carry is tied off! Less crying will also be because parents are reassuringly close to babies and able to respond to any distress cues early, before loud crying begins. Crying is communication, after all, not manipulation. A young baby has not yet developed the cognitive skills needed to choose an action to cause a reaction; baby just knows that something feels wrong. Responsive parenting helps to build a baby’s brain and to teach him/her that the world around it is friendly, and that he/she is loved and cared for. It is easier to respond early to a baby who is next to you, and meeting their needs early on, rather than missing cues and then having to spend quite a lot of time calming down an angry or upset child. This responsiveness also helps a child to build a secure trust in their carer. Babies often sleep better in a sling as they feel safe and secure when held by someone who loves them. Gentle motion is calming for an upset child, and being upright and rocked gently can help with the distress of reflux and wind and exhausted tiredness… slings can help reduce crying. Babies may cry in the sling for many reasons. (see this article for more discussion). If baby carries on crying despite all their other needs being met, a parent can still feel they are doing something loving for their distressed child by keeping them close. Children are therefore not left alone crying for long periods of time, so the stress of the crying is mitigated by the presence of a loved one. This helps to make crying more manageable for both baby and parent. The early months of parenthood can be very hard. Anxiety, isolation and postnatal depression are all increasingly common (certainly in the UK). One in seven women will be diagnosed with a postnatal mental health problem and many more are never diagnosed due to their perceived shame or guilt. This has an impact on how they feel about their children and themselves, and will have a negative long-term effect on everyone’s mental and physical health. Perinatal mental health matters and supporting parents is important. The oxytocin that is released in the parent’s brain during close contact helps to reduce stress and increase bonding; loving feelings often follow loving actions. The massaging feel of a soft carrier can ease tired muscles; and as a baby settles down from crying and sinks into sleep, a parent can begin to feel their confidence in their parenting rising. They begin to believe that perhaps, yes, they can cope, yes, they can be a good parent. Being able to carry a child easily will allow a parent to escape from the house to places they love and to be part of the outside world. Being able to be outdoors is good for mental health, as is being able to be with friends and family rather than alone at home. Being able to get on with daily chores while baby watches from the back or sleeping peacefully will make home life flow more smoothly rather than being a constant burden that gets heavier every day. If one child is content in a carrier, a parent will be more able to care for older children, or provide reassurance to an upset toddler. The school run can be much easier with one child in a sling and hands-free to hold bags or other little hands! 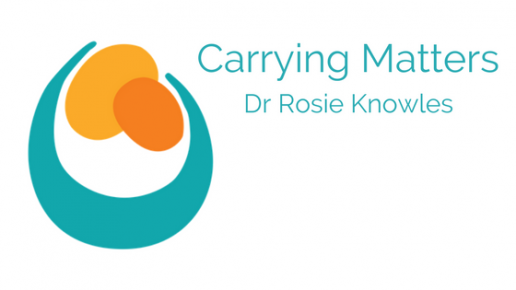 Carriers can help parents and children to reconnect after a day at work or in childcare, especially if both parents and other family members also use slings. Children with disabilities are often very limited in the places they can go and how much of life they can experience… a comfortable, reliable carrier can give a family so many extra opportunities. The disabled child can go in the carrier, or another sibling can be carried while the wheelchair is pushed. It is very hard to manage a wheelchair and a buggy. The close contact for a disabled child can be incredibly therapeutic, especially if there are a lot of hospital procedures or time spent in just one position. Some autistic children find the simple all-around pressure of a carrier really helpful when they are overwhelmed. Children with hip dysplasia casts can be hard to hold; a sling can help. Slings just make life easier, and make everything more manageable. I’ve lost count of the number of parents who tell me they just can’t imagine how they would have coped without a sling. If a child is held close to a parent to carer, he/she will be able to see their face and understand how emotions are conveyed. When a baby smiles, the mirror neurons in his/her’s mother’s brain usually fire up in a matching pattern and the mother smiles back; mirroring her baby’s actions. This helps empathy to build, and a sense of other people’s feelings. Children begin to understand how speech is made, and begin to mimic. They learn about the world based on how their loved ones react to it. This is called triangulation or social referencing; babies and children copy their parents’ responses. They also learn to move their bodies from what they can see and feel. A mother turns her head and points, so a baby learns to follow her movements and sees what she sees; they experience the world together. This is “joint attention”. Closeness encourages and facilitates earlier recognition of baby’s cues, keeping effective channels of communication open. This will help parents to be responsive and increase their baby’s trust, boosting calmness and confidence. Studies suggest that babies and children are talked with more when their parents can see them (as opposed to being on the floor or in facing away buggies). Being held securely in a place of safety makes learning easier, as the brain is not stressed and can absorb and retain information. The sling can be a great place for dealing with the big feelings of children who don’t yet have the cognitive skills to understand why they are feeling this way. Close contact can help a child to regulate emotionally, calm down (and it often helps the parent too!!) See more about this here. It is hard to stay angry and upset when you are being lovingly hugged by someone reliable, and conversation can then flow. Everyone can learn from the experience they have just had. Having this safe and reliable space helps to build a child’s tolerance for stress and become more resilient. Having a sense of control over one’s life is an important part of self identity and good mental health. For a baby, being carried and having a responsive parent helps them to learn that he/she can have some control over what happens to him or her.It is much hard to ignore a child in a sling. This is in contrast to a baby who cries for a need to be met and is usually ignored. They give up asking for support; this is “learned helplessness”. As baby gets older, they can begin to exercise control by choosing whether or not to be arms out, or choosing front, hip or back carries, or not to be carried at all. This also helps to build body autonomy. A sense of control is important for parents too. It can be very easy to feel lost in the new role of parenthood and struggle with this new identity, especially if you were working before baby came along. It is impossible to control or manage small babies, as they are not machines and have not read the baby manuals. Everything can be unpredictable and exhausting. This is why having a sense of choice over what you can do, matters. Being still able to do things for yourself is important. You can still enjoy your identity as a musician, or as gentle dancer, or a cook, and so on, with baby alongside. Being able to meet your baby’s needs while still doing the things you love and feeling you are still in control of your life, is so important. Also, you can control or change the future; by shaping your baby’s brain you will impact their own parenting. Studies into rats show that pups raised in high-nurturing high-licking environments will go on to become nurturing parents (and vice versa with low-nurtured, rat pups who were not licked very much). A rat pup born to a low-licking mother who is rehomed with a high-licking mother will become a high-licking rat mother.. showing that environment and nurturing can change the expected outcome. Parents have the opportunity to control some of their child’s long term future. Both parents can use a sling; the close contact helps dads and partners to form bonds that last a lifetime, also mediated by oxytocin.. Those who have bonded successfully with their children are likely to provide more sensitive parenting and be of greater support to a mother who needs a rest. Children do better when their fathers are active and engaged in their lives. Naturally, a father who derives the same sense of reward and enjoyment from his children is more likely to want to spend time with them. So many people make friends through the shared interest of babywearing. The community can be a wonderful place to make friends, feel less alone, learn and share new skills. Many of these initial friendships persist long beyond babywearing days. 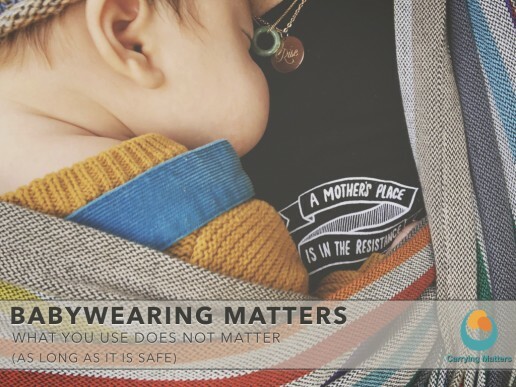 The babywearing community is often less polarised than others (eg in the UK, there are deep divisions about how to feed your baby or the best way to sleep); but we can all carry babies safely and enjoy it. 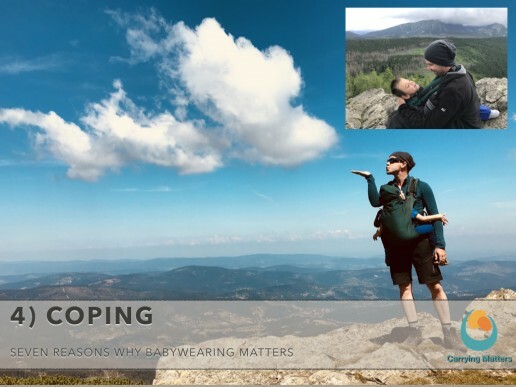 In summary, there are many reasons why babywearing matters for babies, their parents and society. (You can read more here!) It is not the type of carrier that matters; it just needs to fit the child, fit the parent and to be safe. When children and parents are lovingly connected to each other and in tune, magic happens.